Menzin and Fayne Bakian look up to see the entire swarm of alien bugs have been destroyed. Both of them realize that they have been saved by Fayne's mother and Nova Corps member Eve! Eve Bakian, carrying her other daughter Anwen, lands and the family has an emotional reunion. Anwen informs everyone that her grandfather sacrificied himself to save her. Eve confirms it as she reveals her father's shredded stocking cap. Menzin wants a few moments to process everything that has happened. His wife tells him that there isn't time for talking right now and pulls out a handful of Nova star medallions. Eve states that the family needs to "ruck-up". She begins the process by placing one of the stars on Anwen's forehead. Suddenly, the oldest Bakian daughter finds herself wearing red and black Nova armor! Eve Bakian hands the next star to Fayne who wants to give it to their dog ZigZag. The little girl's mother tries to explain that it doesn't work that way. Fayne believes it can and places it on the dog's head. Suddenly, ZigZag's body is covered in pink and black armor! Eve points out that she stands corrected. A little while later, the entire Bakian family has been gifted with Nova powers. Menzin has green and black armor and Fayne is given purple and black armor. Eve announces that it is time for all them to receive their training. Anwen wants to start with the flying powers. Her mother states that it's not usually the first power taught but they don't have a choice. Eve tells them to imagine they're being carried through the air on a rope. Amazingly, all of the Bakians find themselves flying except for ZigZag. Eve Bakian again has doubts about her until the dog launches herself into the sky! As the family flies over the city, Anwen mentions to her mother that she found a glowing block rock inside an alien bug's nest. Eve instantly recognizes it as the Mind Stone. Before the female Nova can explain further, the family is attacked by a large swarm of alien attackers! Eve tells her family to stretch out their arms and imagine they are holding the sun in their hands. Suddenly, the alien swarm finds itself being blasted with Nova Force! The leader of the Novas continues to instruct the rookies. She informs them to stay back to back as a group. She also wants Fayne to steady her arm since she's missing too many of the bugs. Menzin is told to fire faster even if he's lacking depth perception due to having only one eye. Anwen is fighting a group of attackers on her own but realizes that their strategies aren't working. Her mother agrees and pulls out the Mind Stone. With great concentration, Eve is able to control the bugs and commands them to depart. The Nova leader gives her family one more lesson. She makes it clear that they are to never spare a bug. 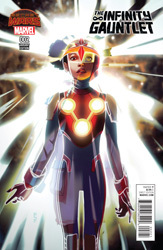 To show her resolve, Eve channels the power of the Mind Stone through her Nova armor and instantly destroys the alien swarm! Eve leads the rest of the Bakians to Nova Headquarters. However, she is stunned to find it decimated and the thirty Novas who resided there are dead! Inside, Mrs. Bakian realizes that the attack was launched in order to steal the other power stone which was stored inside the headquarters. She reveals that the Nova Corps had been attempting to collect all six of the power stones and contain them into a gauntlet. Eve speculates that if they can assemble all the stones, they might be able to destroy the alien bugs completely. Elsewhere, Star-Lord meets up with Gamora on a mountain top. He tries to lie to her that he didn't find anything at the Nova Headquarters but Gamora demands the truth. Star-Lord admits that the Novas didn't have all the stones but he was able to recover one which should make them rich if they can find the right buyer. 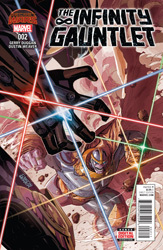 At some time in the future, Thanos finds himself fighting a Nova who possesses the gauntlet with two stones inside it. The mysterious Nova is able to easily beat Thanos into the ground while demanding justice. The mad Titan has two of the power stones but it doesn't appear to be giving him an advantage. Having been soundly defeated, the evil alien uses the Time Stone to teleport back to his original time period. Inside an abandoned building, the defeated Thanos finds himself facing another version of himself. He tells this undefeated Thanos that the same fate has happened again due to the defeat. The second Thanos claims he will have to try harder next time. The beaten Thanos disagrees and kills the other with an energy blast. Thanos picks up a power stone and simply states that it's time for a new strategy.